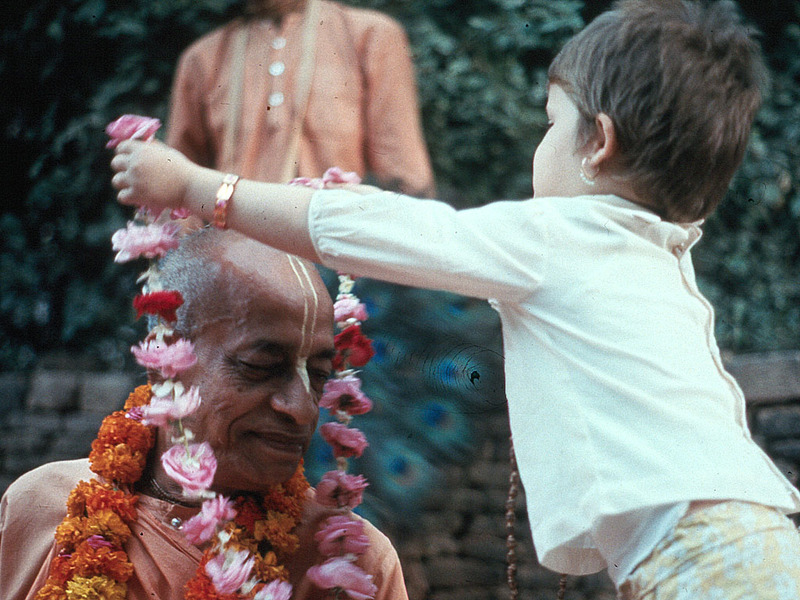 Learning to love Krishna is something like developing love for family and friends in our everyday life. 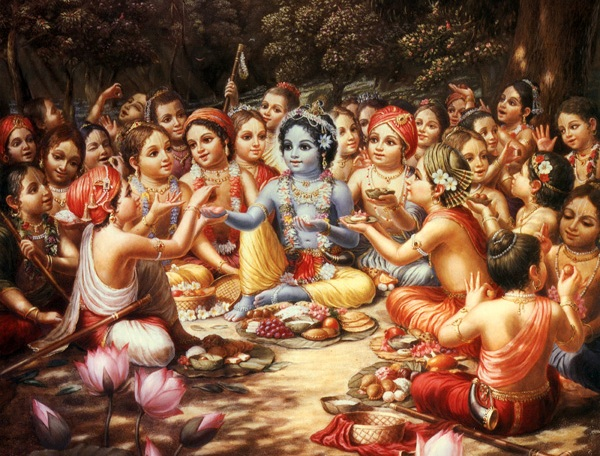 But we can offer all aspects of our life to Krishna, and one of the most important and practical offerings is food. Krishna declares that devotees who eat food first offered to Him make spiritual advancement but those who prepare food for personal sense enjoyment “verily eat only sin” (Bhagavad-gita 3.13). By offering tasty vegetarian dishes for Krishna’s pleasure and then eating His remnants, we not only avoid sinful reaction, but also gradually develop our loving relationship with Him. After all, love is all about give and take. And Krishna is teaching us give and take. So the Krishna consciousness movement is so nice. You can make direct friendship with Krishna. You can become direct servant of Krishna. Krishna tells Arjuna, “If one offers Me with love and devotion a leaf, a flower, fruit, or water, I will accept it.” (Bhagavad-gita 9.26) Out of His kindness, Krishna will accept even the smallest token of our faith — even a little water or a tulasi leaf — if it is offered with love. When Krishna asks us to make such an offering, He is really inviting us to reawaken our eternal, blissful relationship with Him. He wants our love. And so the key ingredient in the preparation and offering process is our affection for Him, our desire to please Him. As the Supreme Lord, the cause of all causes, and the controller and the proprietor of everything, Krishna is atmarama, self-satisfied. As Srila Prabhupada explains, Krishna does not need food, yet He will accept the offering of a devotee who wants to please and love Him (Bhagavad-gita 9.26 p). Krishna is not hungry for food, He hungers for our love and loving exchange with Him. I offer my respectful obeisances unto His Divine Grace A.C. Bhaktivedanta Swami Prabhupada, who is very dear to Lord Krishna, having taken shelter at His lotus feet. Our respectful obeisances are unto you, O spiritual master, servant of Saraswati Goswami. You are kindly preaching the message of Lord Caitanyadeva and delivering the Western countries, which are filled with impersonalism and voidism. I offer my obeisances again and again to Lord Krishna, who is always worshiped by qualified brahmanas and is very dear to them. He is always concerned with the welfare of the cows, the brahmanas, and the whole universe, and He gives pleasure to the cows, land, and senses. 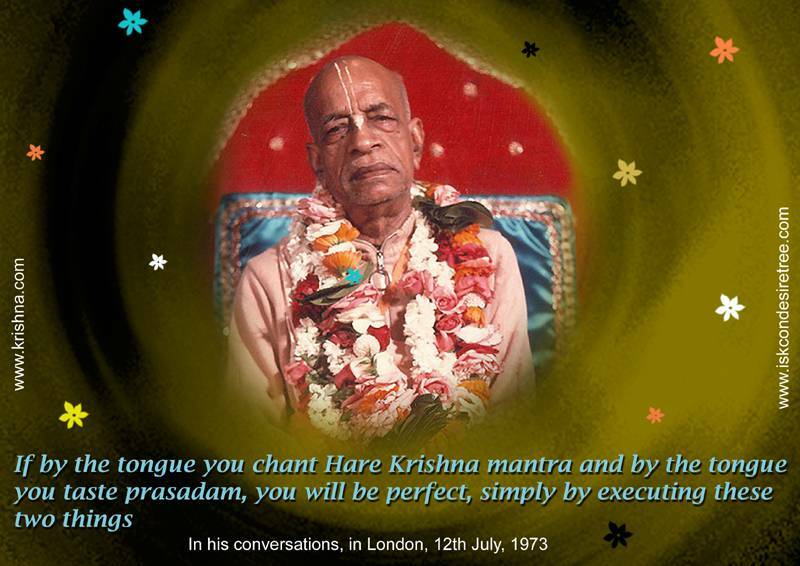 From the time you take formal shelter of an ISKCON guru, please recite the mantra of your own guru three times before reciting Srila Prabhupada’s pranam-mantra (the first in the list above). Meditate on offering the food to your guru, who then offers it to Krishna. Leave the offering in front of Krishna for ten-fifteen minutes. The devotee doing the offering is presenting everything to his own spiritual master, who will then offer the bhoga through the guru-paramparä to Lord Caitanya, Lord Krishna, and Their associates. That’s why, when offering bhoga we chant the pranam-mantras to the spiritual master, Lord Caitanya, and Lord Krishna. We are praying that They will be kind enough to accept our offering, despite our many faults and limitations. And we are doing things in a way that is approved by Them – and pleasing to Them! Once Krishna has accepted our offering, we can show our affection and respect for Gurudeva, guru-parampara and Krishna’s associates by offering His remnants first to them in gratitude. idam maha-prasadam om sangopangastra-parshadebhyo namah. Leave the maha-prasadam with them for a few minutes and then remove it and clean the area for Krishna’s pleasure and theirs. O Lord, this material body is a place of ignorance, and the senses are a network of paths leading to death. Somehow we have fallen into this ocean of material sense enjoyment, and of all the senses the tongue is the most voracious and uncontrollable. It is very difficult to conquer the tongue in this world. But You, dear Krishna, are very kind to us and have given us such nice prasadam just to control the tongue. Now we take this prasadam to our full satisfaction and glorify You- Sri Sri Radha and Krishna – and in love call for the help of Lord Caitanya and Nityänanda. It is best to honor maha-maha-prasadam in a clean, peaceful place either alone or with friends/family. Talk at the table should be light-hearted and pleasing to the heart. It’s best to wash the mouth and hands both before and after the mercy meal. I read so much, and hear even more so, on being humble and not just simply humble but humbler than a blade of grass. It feels nice as I read such terms and collect more ‘information’ on how to get into the ‘mood’ of being humble but whenever I am put into a test I fail miserably, a deadly mixture of hardheartedness, passion and ignorance takes over my consciousness. I simply remain a puppet in the hands of three modes of nature. Many a times I wonder, and now a days also pray to Lord, as to what are You trying to teach me by putting me in such circumstances? Doesn’t the Lord already knows that I have very weak spiritual muscles, doesn’t He know that I will fail such tests, they why? Is it to make me more humble and tolerant or is it tell me that I am just a show bottle devotee with no real substance inside me or to let me realise that I do not have any love for Krishna as compassion for others is directly linked to our love of Krishna or all of the above! It is indeed a very grim and helpless condition for me. My heart cries out to Krishna. I wish my heart could speak directly and cry and cry, cry out so loud that it’s steel like frame would burst open. Unfortunately that too doesn’t happen. As I write these heavy words I introspect within my heart if I have the courage to even repeat these words, forget about asking for it! But strangely today I find some courage in my timid heart as I pray to Lord to please put me through the same circumstances again and again and again, let people insult me, beat me, abuse me, let me fail again and again and again, if this alone would help me remember Krishna at all times then let it happen again and again. I pray to my dear Lord to be merciful upon this wretched soul and take away everything from me, all my so-called possessions, my wealth, my position, my family. Let this world reject me, treat me as a worm in the stool, let the last iota of any sense of ego or to remain independent gets rubbed finely to the ground, but I beg my Gurudeva and Srila Prabhupada to somehow make me remember Krishna at all time. Let my mind and my heart be engaged only in His thoughts alone and let my own life’s drama take a back seat now, I have had enough of it. 1) I am an impious sinner and have caused others great anxiety and trouble. 2) I have never hesitated to perform sinful act for my own enjoyment. Devoid of all compassion, concerned only with my own selfish interests, I am remorseful seeing others happy. I am a perpetual liar, and the misery of others is a source of great pleasure for me. 3) The material desires within the core of my heart are unlimited. I am wrathful, devoted to false pride and arrogance, intoxicated by vanity, and bewildered by worldly affairs. Envy and egotism are the ornaments I wear. 4) Ruined by laziness and sleep, I resist all pious deeds; yet I am very active and enthusiastic to perform wicked acts. For worldly fame and reputation I engage in the practice of deceitfulness. Thus I am destroyed by my own greed and am always lustful. 5) A vile, wicked man such as this, rejected by godly people, is a constant offender. I am such a person, devoid of all good works, forever inclined toward evil, worn out and wasted by various miseries. 6) Now in old age, deprived of all means of success, humbled and poor, Bhaktivinoda submits his tale of grief at the feet of the Supreme Lord. In the end, I pray, may Lord Nityananda be merciful upon me and allow me to visit and roll in the dust of Sri Mayapur Dhama, this seems the only solution to the dreaded disease which has overcome my heart. Aligning ourselves with the will of Krishna. Last few days whatever I have been hearing, reading or even receiving from other devotees, there is one common thread: We should not desire any change in our karmic reaction from Krishna. As the coincidences built up I took them as a clue to share them with everyone. It is not very uncommon to see that when we fall into difficult situations, we earnestly pray to Lord to remove it. It could be a simple cold to a serious illness or some other difficult situations. While this may be acceptable as a neophyte but as aspiring devotees we must endeavor to progress upwards from that level. We are aware that almost all of our current circumstances have resulted from our past actions. 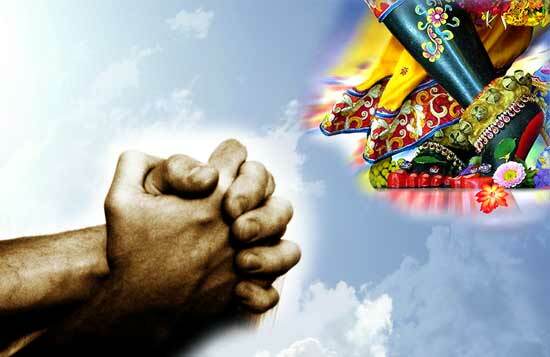 But we should remember another very important point that nothing happens by chance, specially in the life of a devotee. 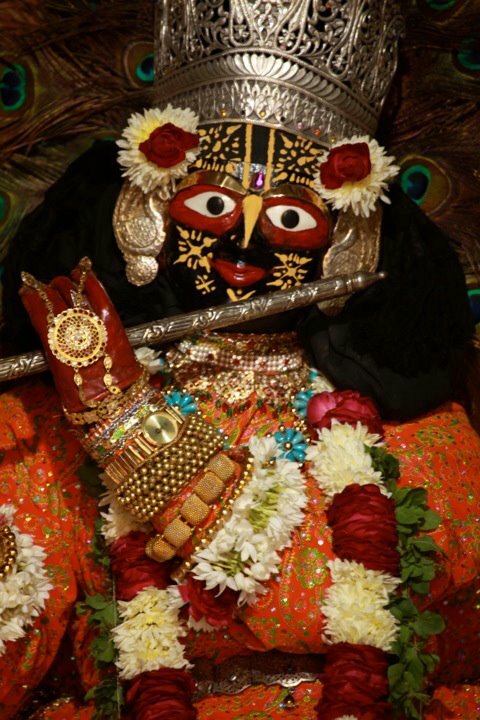 We should have the firm faith that since Krishna is in control so whatever is happening in my life is for my own good. HG Damodar Prabhu sent me the below two SMSs yesterday. Srimad Bhagavatam is calling the devotees in the mode of ignorance and passion as separatists, which we all know is not such a nice quality to possess. So who is a separatist ? Srila Prabhupada explains in the purport of SB3.29 that A separatist is one who sees his interest as separate from that of the Supreme Lord. Mixed devotees, or devotees in the modes of passion and ignorance, think that the interest of the Supreme Lord is supplying the orders of the devotee; the interest of such devotees is to draw from the Lord as much as possible for their sense gratification. This is the separatist mentality. The mind of the Supreme Lord and the mind of the devotee should be dovetailed. A devotee should not wish anything but to execute the desire of the Supreme. That is oneness. When the devotee has an interest or will different from the interest of the Supreme Lord, his mentality is that of a separatist…The devotee has no interest but to fulfill the transcendental desire of the Supreme Lord. Srila Prabhupada writes: there is a similarity between the prayers of Lord Caitanya and the statements of Śrīmad-Bhāgavatam. Lord Caitanya prays, “in life after life,” indicating that a devotee does not even desire the cessation of birth and death. The yogīs and empiric philosophers desire cessation of the process of birth and death, but a devotee is satisfied to remain even in this material world and execute devotional service. By practicing Krishna Bhakti, or Krishna consciousness, we get aligned with Krishna. The firmer the faith we have in trusting Krishna to be my best well wisher, the sharper will be our realisation that everything that is happening in my life is designed for my spiritual progress. Once Srimati mataji asked HG Jananivas Prabhuji `how does he manages to remain so much in Krishna consciousness despite so many ups and downs in Mayapur?’ Prabhuji replied that for any such `event’ he considers that this particular situation is best suited for my own spiritual progress, at my current stage ! Sometimes we see events, in our own or other devotee’s lives, which we may bewilder us but we should have firm faith that Krishna is doing something which is best for that devotee. The reasons could vary from fast forwarding some of our balance karmic reactions so we can quickly come back to Him or to show other devotees, by example, how to respond when calamities fall on us or it may be to complete our detachment from the material world or something else, we are too miniscule to comprehend the thought process of Supreme Lord but we must know that He is our best well wisher. I remember during a workshop, two years back, HH Bhakti Brhat Bhagavat Maharaja asked devotees to first write down few `bad things’ that have happened in our life and then Maharaj asked us to think what message was Krishna trying to give us through that `event’. It was a wonderful experience as each devotee wrote and shared his realisation. An old devotee wrote how he felt very pained when his only child left him for a posting abroad and he now realise that it was Krishna’s arrangement to get prabhuji more attached to Him. Prabhuji now does a lot of service in the temple and is very happy internally! So under such circumstances it helps a lot to pray to Krishna to please let me know what are You trying to convey or teach me in my current situation. While writing this blog I also remember an earlier blog where HG Chaitanya Charan Prabhuji said how we have `half faith’ in Krishna. We believe in Krishna’s power but in our own intelligence, instead, we should have full faith in Krishna’s power as well His intelligence.